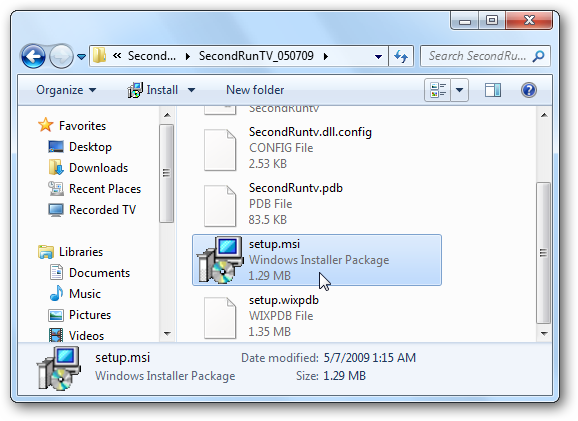 Windows 7 Media Center includes a fair amount of streaming internet TV by default, but you want to add more selections. 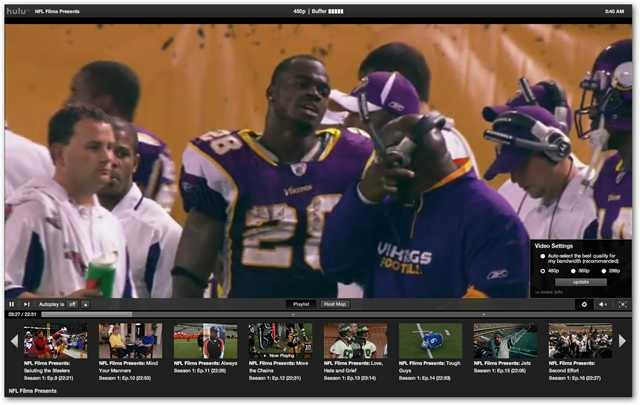 Today we take a look at the SecondRunTV Beta Plugin that allows you to access more streaming channels. 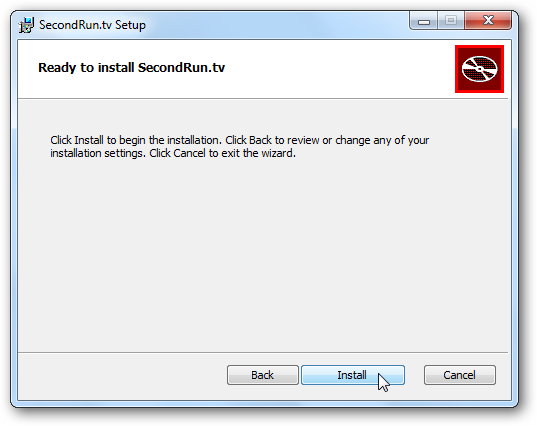 First we need to download the SecondRunTV zip file (link below) and extract it to a convenient location on your machine. Make sure you’re closed out of WMC and run setup.msi. Go through the installation process as normal accepting the defaults. 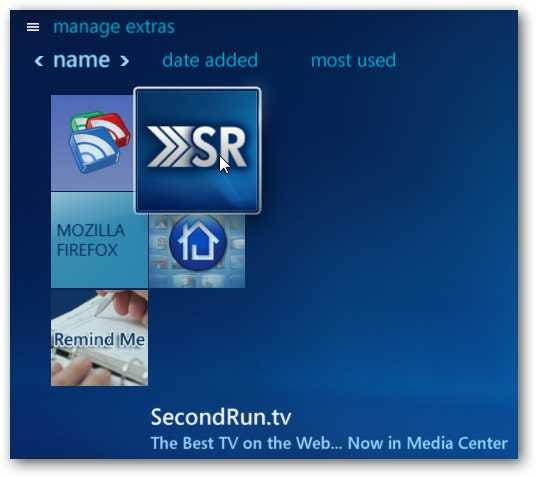 After you have it installed, launch WMC and you’ll find it in the Extras Library…click on the SecondRunTV icon. Now you’ll have a bunch of new channels listed in alphabetical order to choose from including Hulu and YouTube. 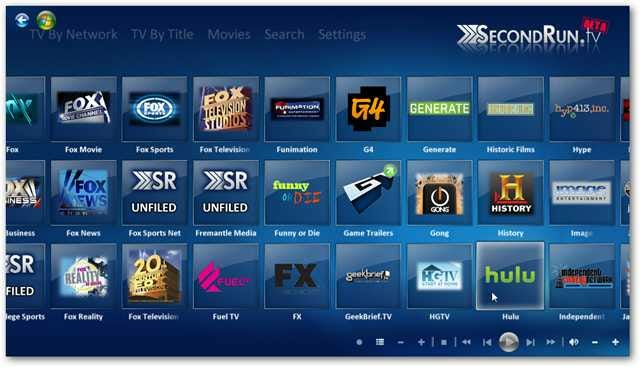 Select a channel and you’re presented with the programs that are available for streaming. 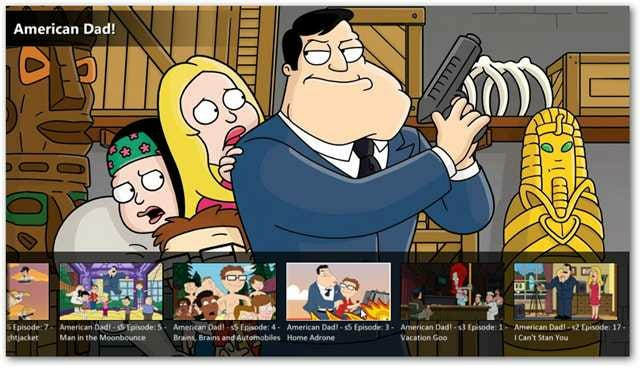 Here we selected American Dad and can choose between different episodes and clips. 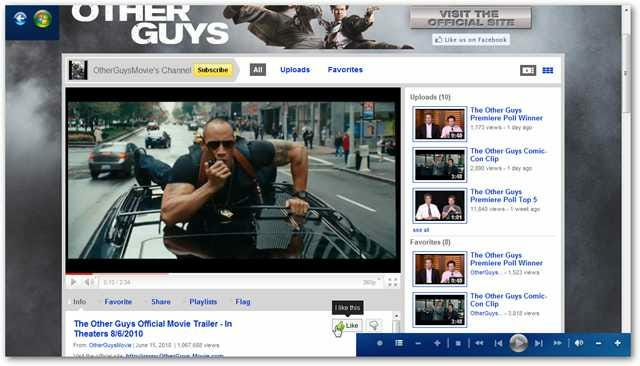 A lot of the content is pulled from Hulu and will launch inside Windows Media Center. You will have the traditional Hulu Controls and can watch in full-screen mode as well. SecondRunTV makes it easier to find different content from a central location inside WMC. 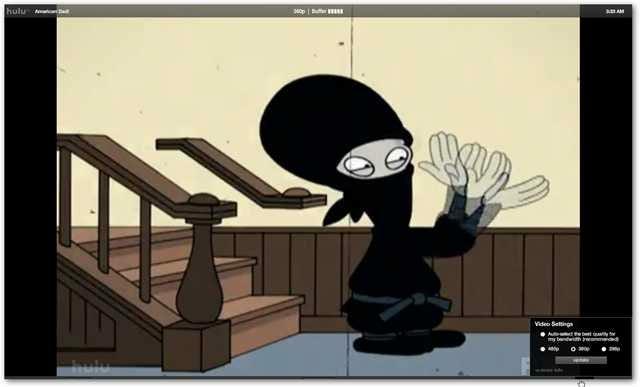 While watching a program you can pull up the menu to select other episodes. 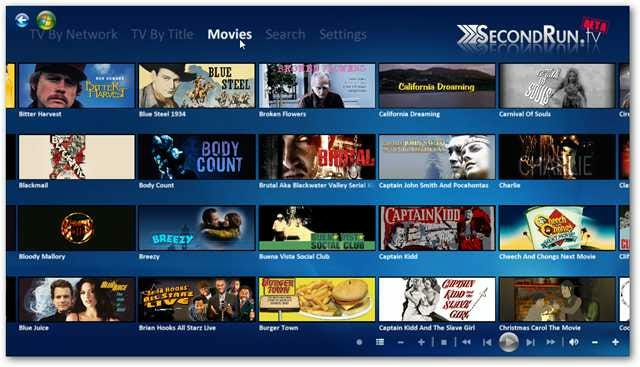 In the top menus you can select different categories like TV by Network, By Title, Movies, and Search. 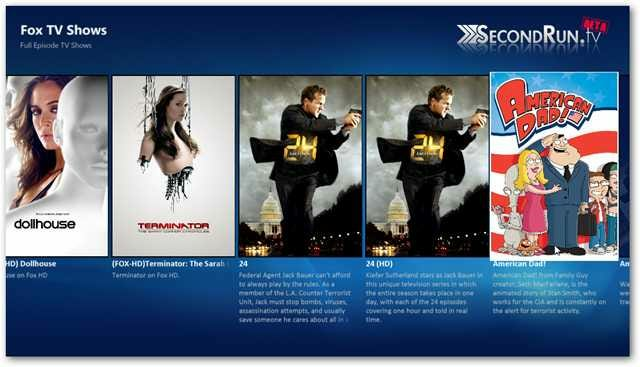 Here is an example of movies that are available to watch. Right now a lot of times there won’t be a Poster Preview of the show on each channel. But there is a title and overview below so you need to watch for that. While the majority of the channel content we tried comes from Hulu, you can also access the site directly. Then you can log in and browse for the free content available. If you’re a Hulu Plus subscriber, it will work fine with that as well. It also offers easy access to YouTube videos and the site itself where you can log in, search for content, and comment on different videos. While this will give you easy access to several online streaming channels in a central location, keep in mind it’s still in Beta. We experienced some freeze ups and crashes occasionally and it doesn’t currently work with extenders. 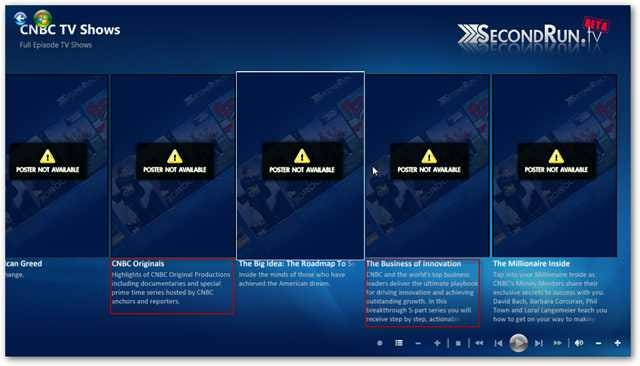 If you’re an early adopter and want to check out what SecondRunTV has to offer, you might want to try it out. As the project continues to develop we would only expect more features and better stability. If you live in the UK, another plugin you might want to try for additional streaming content is TunerFree MCE as most of it’s content is only available in the UK.